This article was written By Rex Baylon on 05 Nov 2010, and is filed under Reviews. Apathy in youth is a well-worn dramatic cliché not just in the realm of cinema, but also in literature, music, theatre, and the visual arts. Artists and hacks alike have mined ad nauseam youth culture’s seemingly languid attitude towards everything. The old castigate the young for not caring and the young look down on the old for not understanding them. In the 1960’s, Kinji Fukasaku, almost approaching middle age, left Toei Studios and for a brief time shed the moniker of action-director by directing a series of avant-garde genre films that approached youth not as a social problem nor as a subject to be exploited, but as a unique sub-culture unto itself. Influenced by what he’d seen in the slums and black market stalls of his neighborhood during the Occupation years, Fukasaku never condemned his protagonists for their actions, but at the same time, he wasn’t delusional enough to grant them anything more than brief spurts of happiness. Kyokatsu koso Waga Jinsei (Blackmail Is My Life), made in 1968 for Shochiku studios, can’t easily be categorized as a yakuza film. It definitely has Fukasaku’s unique stamp on it, but nonetheless it is very much a film of its time. The picture still crackles with energy like the best of Fukasaku’s pictures but what we would later come to know as the Fukasaku style had not yet coalesced into a cohesive whole. Blackmail Is My Life is a film about a group of chinpira, young punks with no affiliation to a specific gang or clan. These social outcasts, who bear a resemblance to the Barrow gang in Arthur Penn’s Bonnie and Clyde, released the year before, have turned to blackmailing the rich and powerful to survive during Japan’s postwar economic boom period. Although they may exploit the corrupt, it would be highly inaccurate to label them as contemporary Robin Hoods. Fukasaku’s protagonists are ruled mainly by two things: Western youth culture and the very real economic divisions in Japanese culture as progress led to extremes in wealth for some and a hard scramble existence for many. Shun Muraki, the leader of the gang, played by Hiroki Matsukata, is not ruled by the concepts of giri or ninjo that typical yakuza protagonists were in earlier ninkyo-eiga, many of which were produced by Fukasaku’s previous home, Toei studios. What drives Muraki is quite simple: greed and a distaste for any authority figure other than himself. He gets on the path of becoming a blackmailer after being brutally beaten up by a couple of yakuza for not taking the hush money they offer him. Yet the irony is that Muraki’s reasons for not taking the money are less than noble. In fact, the only reason why he didn’t take the cash was because of his innate hatred for the old guard that had a vice grip on Japan’s economic and political system. Within the framework of this genre picture, Fukasaku seems to be commenting on the fact that the only ideological difference between pre-war and postwar Japan is that the country has traded in militarism for consumerism. And, although Muraki may hate the power players, he has no desire to obliterate the system; rather, he wants membership into the club. Although the film has a rather episodic plot structure, the crux of the story is the scheme to acquire the Otaguro Memorandum, a document that could inevitably bring down the entire Japanese ruling body. Unlike the other marks they previously hit, though, Muraki and his friends aren’t just going up against crooked bootleggers, two-bit drug dealers, or petty extortionists. This time they are going up against a system, to be more exact an institution, and it’s no surprise that not only do they fail, but their attempt to topple the status quo will cost each of them dearly. Within the Fukasaku universe, there are really no heroes, and in Blackmail Is My Life, he shows a society of criminals preying on other weaker criminals. Humanity with all its gadgets and toys is reduced to that of animals feeding off the weak until they themselves end up as a meal for a much larger predator. What kept me fascinated throughout the film’s runtime though was watching the group dynamics and interpersonal relationships within Muraki’s gang. Fukasaku never strays too far from Muraki and his small circle of friends and it’s a telling sign that one rule that the group strictly adheres to is that none of them makes a concerted effort to make new friends or to get to know anyone outside of their immediate gang. Even when Muraki takes up with an actress she is treated merely as eye candy and their Nedan bjuder vi pa vart eget gratis Blackjack -spel. scenes lack the tenderness and chemistry that Muraki has with Otoki, the only female member of the gang, played by Tomomi Sato. Muraki, Otoki, Seki (Hideo Murota), and Zero (Akira Jo) are a makeshift family for each other, with each member fulfilling a specific role in the group. Any additions or subtractions to the formula will ultimately lead online slots to disaster; thus, although Fukasaku may idealize the group, he also sees it as something fragile and constantly in danger of crumbling because of outside forces. What’s also interesting about Muraki and his friends is how much they embody the youth culture of the 1960’s. Instead of adhering to traditional Japanese values like conformity and valuing the group/society over the needs of the individual, Muraki and his friends have no loyalty to anyone but themselves and their small clique. We feel sympathy for this band of amoral punks because they unabashedly take what they want and, because of their youth and the security that being in a group affords, they feel impervious to the possible reprisals that might come down on them for their actions. Of course, they soon find out that the bonds they’ve formed with each other offer no real protection and eventually their insularity becomes a hindrance to their survival as they go after bigger and more powerful targets. Inevitably, in a Fukasaku film, the protagonists come to the harsh realization that loyalty and friendship is just as useless as giri and ninjo. Those who survive until the end are left all alone, worse off than when we first met them and ultimately victims of a society that would like nothing better than to forget or ignore the inherent corruption within the social system. 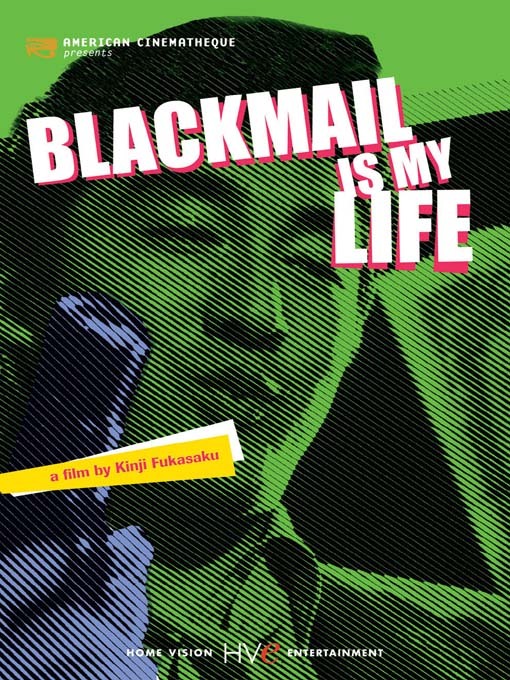 It is easy to get lost in the visual techniques and film callbacks that Fukasaku utilizes to tell the story in Blackmail Is My Life. During Muraki’s initial meeting with the actress Natsuko Mizuhara (Yoko Mihara), who would later on become his girlfriend, Fukasaku pays homage to Mike Nichols 1967 film The Graduate by framing a shot that harkens back to the iconic seduction scene between Mrs. Robinson and Benjamin Braddock. Muraki’s seduction techniques are a far cry from Mrs. Robinson’s though. expired domains . The comedy and sexual naivety found in the character of Benjamin Braddock is replaced with unadulterated violence and Muraki is shown to be not the charming fellow we thought he was but instead are witness to an irrational childlike brute trying to be a tough guy and coming off as nothing better than a monster. Also, the gang’s techniques for gathering intel on their targets is reminiscent of the espionage thrillers, the James Bond series being the most famous, that were popping up in theatres on both sides of the Pacific. Yet, whereas James Bond has the aid of fancy gadgets and his charm, Muraki and his friends are mere amateurs, like children playing a game. Their strength lies in their ignorance of their own mortality and a narcissistic sense of entitlement that all youth seem to possess. The most glaring film reference in the movie, though, is the utilization of the theme from Seijun Suzuki’s Tokyo Nagaremono (Tokyo Drifter) as a great use of counterpoint to the actions we are watching on the screen. Whereas the yakuza protagonist in Tokyo Drifter is a stoic and honorable individual, faithful to the disparate virtues of giri and ninjo, Fukasaku reduces Suzuki’s film into what it really is, pop culture ephemera. The cinema before Fukasaku had constructed an idealized image of the yakuza as a tragic figure to be worshipped for their masculinity, but by the time Fukasaku was through with the yakuza genre audiences finally realized how empty that existence was and how those who embraced that lifestyle were never going to be commemorated as anything more than the losers of society, doomed to die ignoble deaths. Rex Baylon is one of VCinema”s newest contributing writers. Check out his blog, Film Expressions.